Lamellar corpuscle, with its system of capsules and central cavity. a. Arterial twig, ending in capillaries, which form loops in some of the intercapsular spaces, and one penetrates to the central capsule. b. The fibrous tissue of the stalk. n. Nerve tube advancing to the central capsule, there losing its white matter and stretching along the axis to the opposite end, where it ends by a tuberculated enlargement. Lamellar corpuscles, or Pacinian corpuscles, are one of the four major types of mechanoreceptor. They are nerve endings in the skin responsible for sensitivity to vibration and pressure. They respond only to sudden disturbances and are especially sensitive to vibration. The vibrational role may be used to detect surface texture, e.g., rough vs. smooth. Lamellar corpuscles are also found in the pancreas, where they detect vibration and possibly very low frequency sounds. Lamellar corpuscles act as very rapidly adapting mechanoreceptors. Groups of corpuscles respond to pressure changes, e.g. on grasping or releasing an object. Lamellar corpuscles are larger and fewer in number than Meissner's corpuscle, Merkel cells and Ruffini's corpuscles. The Lamellar corpuscle is approximately oval-cylindrical-shaped and 1 mm in length. 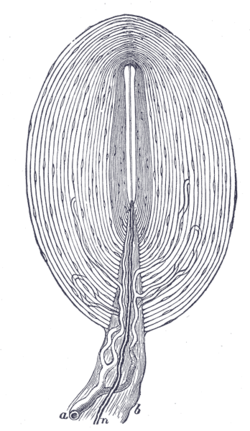 The entire corpuscle is wrapped by a layer of connective tissue. Its capsule consists of 20 to 60 concentric lamellae including fibroblasts and fibrous connective tissue (mainly Type IV and Type II collagen network), separated by gelatinous material, more than 92% of which is water. The lamellae are actually very thin, flat, epithelial cells inside the capsule and modified Schwann cells ,, male in nature due to its chromosomes ,inside the inner core of the corpuscle. The center of the corpuscle is a neurite of single afferent with oval cross-section and unmyelinated at the receptive region. Lamellar corpuscles are rapidly adapting (phasic) receptors that detect gross pressure changes and vibrations in the skin. Any deformation in the corpuscle causes action potentials to be generated by opening pressure-sensitive sodium ion channels in the axon membrane. This allows sodium ions to influx, creating a receptor potential. These corpuscles are especially susceptible to vibrations, which they can sense even centimeters away. Their optimal sensitivity is 250 Hz, and this is the frequency range generated upon fingertips by textures made of features smaller than 1 µm. 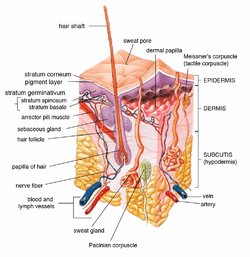 Lamellar corpuscles cause action potentials when the skin is rapidly indented but not when the pressure is steady, due to the layers of connective tissue that cover the nerve ending. It is thought that they respond to high-velocity changes in joint position. 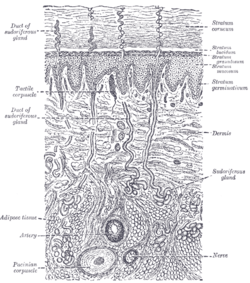 Lamellar corpuscles have a large receptive field on the skin's surface with an especially sensitive center. Lamellar corpuscles sense stimuli due to the deformation of their lamellae, which press on the membrane of the sensory neuron and causes it to bend or stretch. When the lamellae are deformed, due to either pressure or release of pressure, a generator potential is created as it physically deforms the plasma membrane of the receptive area of the neuron, making it "leak" Na+ ions. If this potential reaches a certain threshold, nerve impulses or action potentials are formed by pressure-sensitive sodium channels at the first node of Ranvier, the first node of the myelinated section of the neurite inside the capsule. This impulse is now transferred along the axon with the use of sodium channels and sodium/potassium pumps in the axon membrane. Once the receptive area of the neurite is depolarized, it will depolarize the first node of Ranvier; however, as it is a rapidly adapting fibre, this does not carry on indefinitely, and the signal propagation ceases. This is a graded response, meaning that the greater the deformation, the greater the generator potential. This information is encoded in the frequency of impulses, since a bigger or faster deformation induces a higher impulse frequency. Action potentials are formed when the skin is rapidly distorted but not when pressure is continuous because of the mechanical filtering of the stimulus in the lamellar structure. The frequencies of the impulses decrease quickly and soon stop due to the relaxation of the inner layers of connective tissue that cover the nerve ending. This adaptation is useful, as it stops the nervous system from being overloaded with unnecessary information such as the pressure exerted by clothing. The Pacinian corpuscle was named after its discoverer, Italian anatomist Filippo Pacini. The term Golgi-Mazzoni corpuscle (distinct from the Golgi organ) is used to describe a similar structure found only in the fingertips. ↑ Biswas, Abhijit; Manivannan, M.; Srinivasan, Mandyam A. (2015). "Vibrotactile Sensitivity Threshold: Nonlinear Stochastic Mechanotransduction Model of the Pacinian Corpuscle". IEEE Transactions on Haptics. 8 (1): 102–113. doi:10.1109/TOH.2014.2369422. PMID 25398183. ↑ Thomas Caceci. "Example: Lamellar Corpuscle". VM8054 Veterinary Histology. Retrieved 2013-05-19. ↑ Cherepnov, V.L. ; Chadaeva, N.I. (1981). "Some characteristics of soluble proteins of Pacinian corpuscles". Bulletin of Experimental Biology and Medicine. 91 (3): 346–348. doi:10.1007/BF00839370. PMID 7248510. ↑ Scheibert, J; Leurent, S; Prevost, A; Debrégeas, G (2009). "The role of fingerprints in the coding of tactile information probed with a biomimetic sensor". Science. 323 (5920): 1503–6. doi:10.1126/science.1166467. PMID 19179493. ↑ Skedung, Lisa, Martin Arvidsson, Jun Young Chung, Christopher M. Stafford, Birgitta Berglund, and Mark W. Rutland. 2013. "Feeling Small: Exploring the Tactile Perception Limits." Sci. Rep. 3 (September 12). doi:10.1038/srep02617.